Make yourself at home in this gorgeous home in upscale Lantana Masterplanned Community. Spacious open concept home with over 3700 square feet of living space. Four large bedrooms all downstairs, game room and bonus room upstairs with a full bath. Gourmet kitchen includes stainless steel appliance, gas cook top, breakfast nook and granite counter tops. Amenities in this community include a private golf course and club, numerous pools, trails and greenbelt. This is a pet friendly property. Be sure to schedule your showing today! Spectacular 4 bed, 3 bath, 3044 sq. 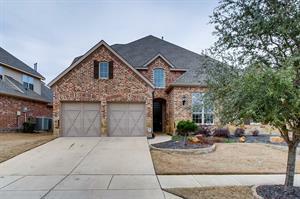 ft., 2 story home in McKinney, TX! Open and spacious floor plan. Spectacular island kitchen with tons of cabinets, plenty of counter space and breakfast area. Formal dining/office areas. Lovely living room with huge windows, vaulted ceilings, and beautiful brick fireplace. Over-sized master suite features dual vanities, luxurious tub and separate shower! Game room up! Covered patio and big back yard! Schedule your showing today! Beautiful trees decorate the front yard of this fabulous home in Colleyville with 4 bedrooms, 2 living and 2 dining rooms. Neutral tones throughout, updated fixtures, ceiling fans and blinds. The galley kitchen has a breakfast bar, built in microwave, gas cook top, deep pantry and a cozy breakfast nook overlooking the backyard. Guests have their own suite in the back, which includes a living, bedroom and full bath. Large gorgeous lot with a pool. Come and do some country living in the heart of Colleyville! The information contained herein has been obtained through sources deemed reliable but cannot be guaaranteed as to its accuracy. Any information of special interest should be verified with Pathlight Property Management. 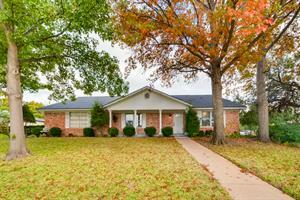 Beautiful well-maintained four bedroom, two and one half bath home located in charming Richardson. Lovely wood floors, large living room with brick fireplace. Great patio, and spacious backyard for entertaining. Great kitchen with breakfast area. Two car garage located in rear of home. Directions: From US-75 take Centennial Blvd (Spring Valley West), Right on S Yale Blvd. Right on Baylor Drive. Baylor Drive is just past Buckingham Rd. If you reach Richland Drive you have gone too far. Beautifully home that is located near golf course in the lakeside resort gated community. Private executive golf course, community pool, fitness center, cabana, tennis park and trail all part of this lovely community. This amazing home 4 bedroom 2 1/2 bath home has wood burning fireplace, large kitchen with double oven, pantry, thermal windows, hard woods. Large master bath and a private balcony overlooking the golf course. Driving directions: I-30 to Village Drive. Rt on Lakeside Dr. Rt on Augusta Trl. Lft on Waterview. Spectacular 4 bed, 2 bath, 3110 sq. ft. 2 story home in Grand Prairie, TX. Open and spacious floor plan. Elegant formal dining room and office/study area. Open island kitchen provides tons of cabinets, plenty of counter space, butler's pantry and breakfast area. Cozy living room with soaring ceilings. Spa like master retreat down features dual vanities, luxurious tub and separate shower. Game room and remaining bedrooms up! Large backyard! Be sure to schedule your showing today! Professionally managed by Pathlight Property Management, the exclusive property manager for Home Partners of America, offering excellent customer service, 24/7 emergency maintenance service, online application and payments, and pet-friendly options. HOA occupancy restrictions may apply. BEAUTIFULLY UPDATED 4-3-2 with 2 Living & 2 Dining areas features HW floors downstairs, Granite, subway tile backsplash, and beautiful paint! Other features you'll love are HUGE OPEN Living, Dining & Breakfast area, nice appliances including gas cooktop, split bedrooms, & Master retreat with balcony overlooking the greenbelt & big backyard. Lots of character & custom features in this must see! Just at 3,017 sq.ft in this exceptional home in Celina ISD. Gorgeous one story home on a cul-de-sac!!!! This spacious home boasts two living areas and two dining areas. Oversized kitchen with island is a chefs paradise. Ample cabinet space in the kitchen for all your culinary storage needs. Split floor plan gives plenty of privacy to the master suite. Master bath includes dual sinks and a garden tub. This is a pet friendly property. Move in for property is scheduled for April 16.